House Democrats took their first major legislative votes of the new Congress, approving two measures to end the 13-day partial government shutdown — despite a presidential veto threat. Though both measures are expected to stall in the Senate, newly minted House Speaker Nancy Pelosi ruled out approving any funding towards the president’s $5.6 billion request for a physical barrier at the southern border – renewing the impasse that led to the shutdown last month. 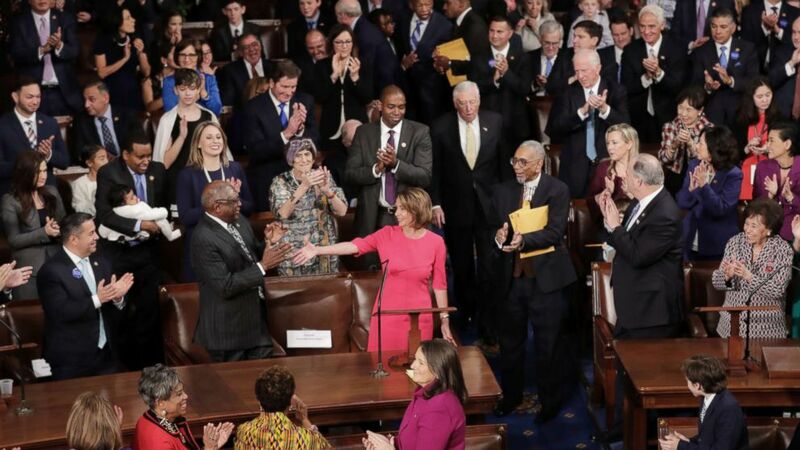 Speaker-designate Rep. Nancy Pelosi is applauded by members of Congress after being nominated during the first session of the 116th Congress at the U.S. Capitol, Jan. 03, 2019 in Washington. In light of newly divided government, Thursday’s votes set down a legislative marker for the House of Representatives, but did not produce a bipartisan resolution to the border wall stalemate or bring the shutdown any closer to its end. A vote on a package of six appropriations bills late Thursday night passed 241-190, while lawmakers also approved a narrow measure to extend funding for the Department of Homeland Security until Feb. 8 by a tally of 239-192. President Donald Trump speaks in the press briefing room at the White House, Jan. 3, 2019, in Washington. Separately, the White House signaled Thursday that the president would veto either measure if the legislation reached the Resolute Desk. Senate Majority Leader Mitch McConnell has also pledged to block the measures from a vote in the upper chamber. While Trump said last month that he would be proud to own a shutdown in order to secure funding he has demanded to build a southern border wall, counselor to the president Kellyanne Conway argued that the president no longer bears responsibility for the shutdown that’s resulted in the closure of approximately a quarter of the federal government, impacting 800,000 federal workers. “He doesn’t own the shutdown any longer,” Conway said when asked if the president regrets his past statement willingly taking the blame. She argued that because the House of Representatives passed a package last month that included the president’s requested $5.6 billion in funding, the buck now passes to the Senate. That measure expired with the end of the 115th Congress earlier Thursday. White House senior adviser Kellyanne Conway speaks to reporters about the government shutdown outside the White House, Jan. 3, 2019, in Washington. The broader measure includes funding for the remainder of the fiscal year for every government agency currently closed, with the exception of agencies within the Department of Homeland Security. The second bill would fund DHS through Feb. 8 at the current funding rate of $1.3 billion for border security. “We asked him to give us one good reason — I asked him directly. I said, Mr. President, ‘give me one good reason why you should continue your shutdown of the eight cabinet departments while we are debating our differences on homeland security?’ He could not give a good answer. So we would hope that they would reconsider and would support the very bills that pass the Senate,” said Senate Minority Leader Chuck Schumer of New York.